There’s something about seeing two candles on a cute little birthday cake that makes everyone smile—and then shudder. Sure, he’s as sweet as sugar sprinkles now—but you can’t help but wonder what the next year holds. More independence…more milestones…more tantrums…the terrible twos?!? Help! Maybe it’s not such a happy birthday after all! Relax. With the right parenting strategies and tools, your toddler’s second birthday really can be something you celebrate. And your child’s twos don’t have to be the terrible twos. While you can’t get around occasional tantrums (no, she may not have a cookie for breakfast), you can greatly reduce their number and severity—all while empowering your child to be her very best. By knowing WHY children misbehave in the first place, you can equip yourself with the tools and strategies you need to nip misbehavior – including the terrible twos – in the bud…at two and beyond. 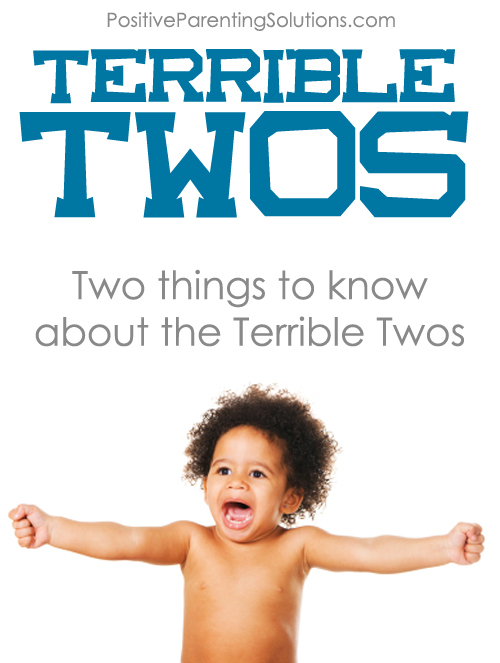 So, what drives the terrible twos? Children have a built-in need for attention. They need to feel a sense of belonging, and if they don’t get attention in positive ways, they’ll subconsciously resort to negative means—like whining, clinging and acting helpless. When you proactively fill your child’s “attention basket” with positive attention (taking 10 minutes to pretend to be dinosaurs, make pizza out of Play-doh, and so on), you won’t see so many annoying attention-demanding behaviors. Children have a built-in need for power. They are looking for a sense of significance—the idea that they have some control over their own world. As with attention, if they aren’t able to feel in control in positive ways, they will attempt to achieve it through tantrums and other negative behaviors (after all, they know who’s REALLY in control during a grocery store tantrum!). While it’s not appropriate to let toddlers call all the shots, letting your two-year-old decide which healthy cereal to eat for breakfast, which shoes to put on, and whether to brush his teeth first of get dressed first, for instance, will ward off the worst of the tantrums. And remember that as difficult as the terrible twos are for you, they’re even more frustrating for your toddler. A toddler can’t articulate what she really needs. In fact, here’s what your little one may wish you knew about his toddler behavior. Giving your two-your-old your undivided attention several times a day and letting him make a lot of decisions throughout the day are two strategies that will go a long way toward reducing typical terrible two behavior—tantrums and whining, for instance. It’s time to say goodbye to the terrible twos, and make your child’s second year something to celebrate again. For more strategies to bring out the best behavior in toddlers up through teenagers, join one of our FREE webinars: Get Kids to Listen Without Nagging, Reminding or Yelling.